It’s been a number of years since I’ve ventured into a large urban area routinely, much less doing it on public transportation. But the experience has broadened my horizons regrading those who live on our gold-paved streets here in America. 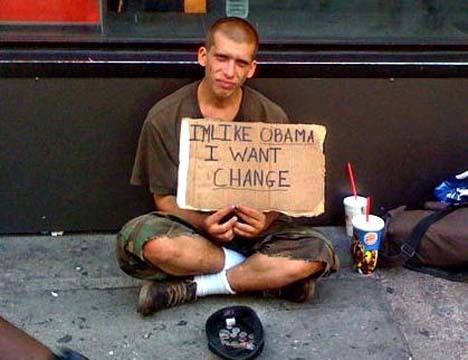 I mean, when I was growing up in middle class Chicago we did travel downtown often enough for me to gander at the plight of the homeless and I did manage to ignore my fair share of panhandlers back in the day. Back then it seemed the more creative homeless folks looking for cash would engage in various forms of street entertainment like playing musical instruments, dancing, and I even recall a mime guy once. Signs were pretty much limited to the traditional, “Need Help”, “Homeless Vet”, and I recall, “Agent Orange Did This” (yeah.. that was a couple wars back). 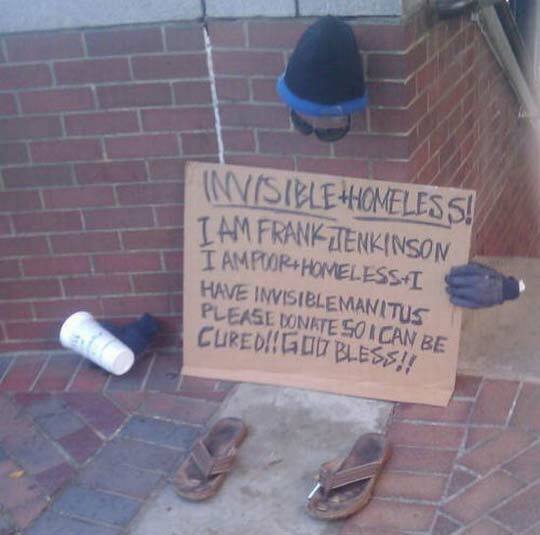 But it seems the last decade or so has brought about some interesting homeless signage; some of these folks could hold their own working on Madison Avenue creating new GEICO commercials. As I was walking across one of those pedestrian overpasses that are common around the Vegas Strip intersections I ran into a fellow who was holding the old flap of a cardboard box that read, “Why lie.. I need a beer”. 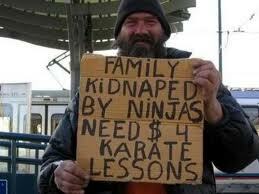 There was another guy holding, “Need $ For Pot”. Nothing like being honest and trying to get the empathy contributors (after all, didn’t we always presume the guy holding the “Money For Food” sign would just spend it on booze anyway?). Strangely, if you want a cross section of all the military conflicts experienced in this country just check out the homeless. Vietnam vets are becoming more rare given they are boomers and aging. It used to be that if you were homeless and you had a sign stating “Vietnam Vet” whether you were or not, you could appeal to the guilt emotion. You’d be hard pressed to find “Panama Vet” or “Grenada Vet” or “Somalia Vet”… but you will certainly find “Desert Storm Vet” along with “Afghanistan Vet” and “Iraq Vet” and I’m guessing they probably do well in their solicitations given since the thankless war in Vietnam the public now thanks vets for their service. Yeah.. there’s no question that being homeless is near being hopeless. 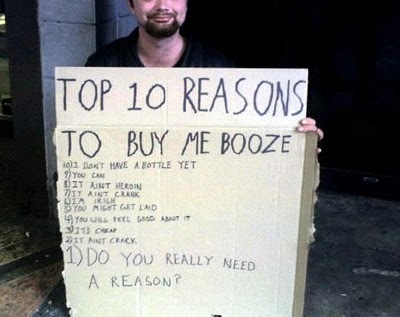 People end up on hard times for many reasons. They are prisoners to their own emotional turmoils brought about by their military experience or just life in general. Collectively they need help but individually they are unable to help themselves. We will always have them in our society. Perhaps when we look at them we see a reflection of ourselves in what could be, or what could have been but for the grace of the Almighty… or fate. But while the homeless represent those in our society that have fallen through the cracks of what we perceive as healthy contributors to the economy, their attempts at begging for money do bring a measure of wit & wisdom to a passer-by stressed by the affairs of their day. In the end it matters not if I dropped a few coins into your homeless can because your sign was witty or I felt sorry for you. What matters is you got the coins. A win-win everyone can take to the bank. A contemporary plea for cash. Give this guy a talk show. This one wins my prize. Not only is he clever making the editorial statement about his plight at being homeless, but he's begging for money in absentia. Creative bit of humorous fiction to break down a potential donor's reluctance. This entry was posted in Social Issues and tagged Advertising, Business, Chicago, Homelessness, Madison Avenue, New York City, United States, Whitney Museum of American Art. Bookmark the permalink. ← So What Exactly Is “An Honest Day’s Work”?